It’s not easy to find the right balance between protecting Florida’s fragile natural resources, supporting agricultural producers, and developing well-planned residential and commercial projects to accommodate the state’s growing population. For more than 20 years, the attorneys at Lewis, Longman & Walker, P.A. (LLW) have been statewide leaders in environmental, land use and government law, helping public and private clients navigate complex, long-term issues. Today, LLW has offices strategically located in Tallahassee, Jacksonville, Tampa Bay and West Palm Beach. Of the 32 attorneys in the firm, five are board-certified in the areas of state and federal government and administrative practice; real estate; and city, county and local government law. “Our firm’s tagline is “See Things Differently” which is a mantra LLW attorneys try to live out each day–bringing a different perspective to their work while striving to identify creative, win-win solutions,” says Diffenderfer. 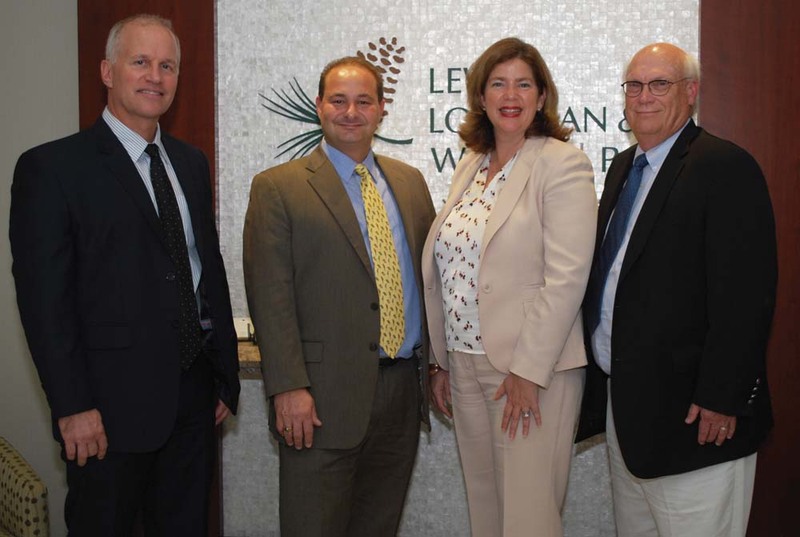 A desire to take control of their legal destiny led Terry E. Lewis, R. Steven Lewis, Anne Longman and Stephen A. Walker to found LLW in 1994 as a spinoff from a Tallahassee-based firm. “Our group began to focus on environmental law, and we had a strong sense of what we wanted to achieve,” says Walker, a former managing shareholder. Andrew J. Baumann, a shareholder who joined the firm a decade ago as an associate with government experience, added that many of the firm’s matters are so complex they require a team effort. “A lone wolf would not fit in well with our environment,” he adds. For more than 20 years, LLW has served clients in both the public and private sectors. That diversification helped the firm weather the 2008-09 recession when private development projects dried up. “We walk the middle line and assiduously avoid conflicts.” says Walker. Through the years, the firm has represented numerous municipalities, government agencies, the state’s five water management districts and the Seminole Tribe of Florida. For example, LLW’s attorneys helped the Broward County Aviation Department win approvals for its South Runway project at Fort Lauderdale-Hollywood International Airport, and assisted the Seminole Tribe with the expansion of its Seminole Hard Rock Casino in Coconut Creek. Baumann has represented St. Lucie County on numerous environmental issues, such as excavating beach sand for transport to Miami, and advising on projects at the Port of Fort Pierce. In some cases, the firm’s attorneys serve as general or special counsel for South Florida cities, handing issues like pension-related matters. As general counsel for the Boynton Beach Community Redevelopment Agency (CRA), Dodge has helped “clean up” the post-recession foreclosure legal work. “Now, there are viable projects underway and real estate activity is back to a normal level.” he adds. On the private side, the firm assists residential builders and commercial developers on complicated land use, zoning and entitlement issues related to their transactions. “We have a long history with many large-scale projects, and have often represented multiple developers over the course of a project,” says Baumann. Throughout Florida, LLW is known for its knowledge and experience in addressing water management issues, including wetlands conservation, drinking water supplies, and pollution discharge permits. The firm’s water-related environmental experience includes coastal navigation issues, dredging, seawalls, drainage and underground pipelines, as well. “We were there right at the beginning of the Comprehensive Everglades Restoration Project,” says Walker, who served on the South Florida Water Management District prior to co-founding the firm. Another original partner, Wayne Flowers, who now leads LLW’s Jacksonville office, was a general counsel for the St. Johns River Management District. The firm also assists the City of West Palm Beach in issues related to its surface water system, including two large reservoirs near I-95.